Allegro MicroSystems has released a new family of automotive AEC-Q100 qualified, monolithic Hall effect current sensor ICs. 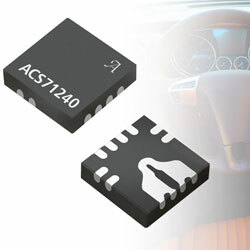 Small and energy efficient, the ACS71240 family is excellent for electric vehicle chargers, DC-DC converters, as well as industrial motor and IoT applications. These new devices provide next-generation improvements over the popular Allegro ACS711 predecessor. The family also features an extremely fast, dedicated over current fault output that has a typical response time of 1.5 µs, improving system safety. This fault output offers an easy means of detecting short circuit events that will stop damage to MOSFETs or IGBTs in inverter, motor and other switching power electronics applications. The device is offered in two very small form factor package options, each offers different levels of galvanic isolation. The tiny 3mm x 3mm, wettable flank QFN package can be used on voltage rails up to 120VDC and allows solder joint inspection needed in zero PPM automotive applications. The standard footprint SOIC8 package is UL certified to 2400VRMS of isolation and offers a working voltage of 420VDC or 297VRMS.